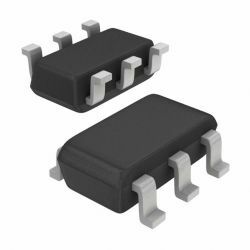 The DIO6015B is high-efficiency, high frequency synchronous step-down DC-DC regulator ICs capable of delivering up to 1.5A output currents. The DIO6015B family operate over a wide input voltage range from 2.7V to 5.5V and integrate main switch and synchronous switch with very low RDS(ON) to minimize the conduction loss. Low output voltage ripple and small external inductor and capacitor sizes are achieved with greater than 1MHz switching frequency.